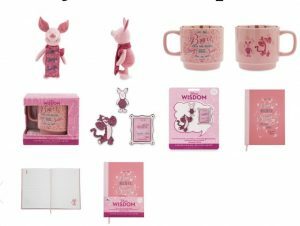 This year the creative folks at Disney have a special collection called the Disney Wisdom collection. Each month they have a new quote from one of their classic characters. And each quote is inspiring and motivating. This inspiring quote is embroidered on the plush Piglet’s scarf. We all know Piglet is a bit squirrely, but this little fellow seems to have a lot of confidence. His smile is enchanting and well, let’s face it, Piglet is a cutie. This plush is the perfect remedy for someone who is having a bad day or is questioning her abilities. And he’s cuddly too! From the tips of his toes to the top of his floppy ears, Piglet measures 17 inches. He’s made of all new materials. Piglet is not washable however it probably wouldn’t hurt him to gently wipe him if something spilled on his body. 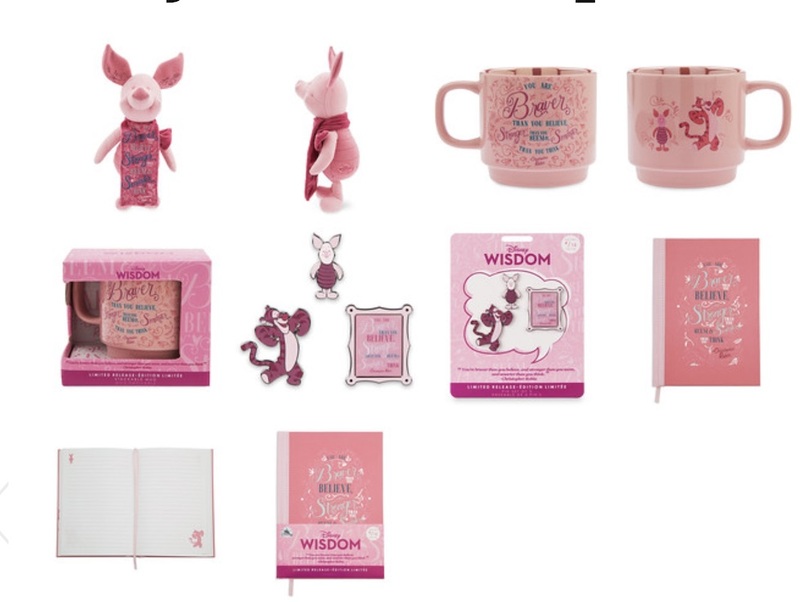 Besides the loveable plush animals, included in the monthly collections are: a ceramic mug, a notebook, and a pin set. The mug is a good reminder for everyone when they start their day with a cup of coffee. 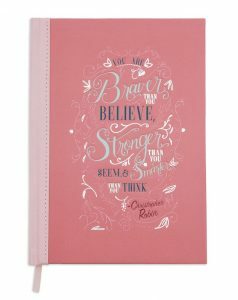 “You are Braver than you believe, Stronger than you seem, and Smarter than you think.” Or keep it at the office for those days when you doubt your decisions or abilities. The notebook is a good item for kids to keep in their backpacks or school lockers. “You are Braver than you believe, Stronger than you seem, and Smarter than you think.” Who wouldn’t feel better after reading that? What makes this limited edition collection exceptional are the quotes that accompany the items each month. They are all ideas that are inspiring and encouraging, and let’s face it, a little encouragement is what everyone needs at some time or another. There are collectors that get them all…just because. However parents might think about getting them or one item and putting it away for just the moment when your child needs a little encouragement. Everyone needs to be reminded “You are Braver than you believe, Stronger than you seem, and Smarter than you think.” And who better to remind us than Piglet? He has survived plenty of tough times, with the help of his friends in the Hundred Acre Wood. 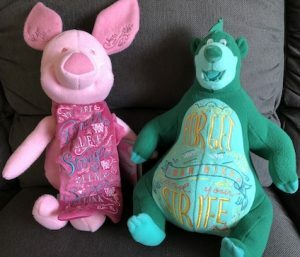 So, for April’s release (available April 20), enjoy Piglet and the motivation from Christopher Robin. “You are Braver than you believe, Stronger than you seem, and Smarter than you think. Francine Brokaw writes about books, products, travel, and entertainment. She has been published in national and international newspapers and magazines as well as Internet websites. She has written her own book, Beyond the Red Carpet The World of Entertainment Journalists, from Sourced Media Books, is the entertainment correspondent for Good Day Orange County, and has her own TV show, Beyond the Red Carpet, on Village Television in Orange County.